Do you stay on the path or do you wander all around it? That’s a simple question but the answers are complicated. It can apply to your practical application when taking a walk – do you go where everyone else has or do you wander around? And it can apply to the way you see God – do you have only one set of steps ordered before you, or are there many alternative routes to get you to where God wants you to go? I remember rapidly approaching high school graduation with a sense of dread. I had good grades, had a college lined up, and my family was proud of me. Seriously, what was my problem? I was …. not sure who I was going to marry. At seventeen. My parents, high school sweethearts, married after my dad’s freshman year in college. But they had known they were going to get married since high school. I looked around, and I … didn’t see any prospects. I thought there must be something wrong with me. Thankfully, after several (cough) missteps in the world of dating, I met my wife and we were married after she graduated from college. I was the ripe old age of twenty-five, crisis averted. Unfortunately, many of people are misguided – I’ll admit I was about dating – into thinking that God had one plan worked out them, and if they stray off the path by even a whisker, it’s all over. Some people believe that God has a plan laid out, a map of down to the minute scientific exactitude, that must be followed or something terrible is going to happen. There are a few problems with that way of thinking, right? put God into a linear, one way of things working, static box that our fluid, all-powerful, compassionate God would never fit in. Imagine visiting a friend’s house for dinner for the first time. You sit down at the table and the father, who sits at the head of the table, tells each of the kids, and the wife for that matter, what and when to eat. Then he tells them what to wear to bed, when they will be getting up, where they will be going to college and who they will be married to. Later, you tell your friend you thought their dad might be a bit controlling. You secretly believe their family to be dysfunctional. But your friend is offended. They think it’s perfectly normal to want to please their father in everything they do. And they are right, it is appropriate to want to please ones father. The only problem is, their father is NUTS! God, on the other hand, isn’t nuts. Now, I’m not, nor have I ever been, a football player. But I know what it’s like to draw up a game plan, and I know that’s quite a bit different than drawing up a map (or a blueprint) of what my life will look like. The thing is that the quarterback and the wide receiver work to get on the same page with the intent of ending up with a first down or even a touchdown. But these plays, and there can be hundreds of them, are spread out over four quarters per game, in hundreds of games over the lifetime of a team. There are defensive variables, substitutions, weather conditions, and more that impact how the routes are run. But there’s never just one way to do it. Often, when we turn to the Bible, we think of people who were used by God in miraculous, amazing, one-of-a-kind ways. Mary the virgin becomes Mary the mother of God. David becomes THE King. But how many of the people who we admire from the Bible actually respond the right way the first time? How many of them take their first “route” to get there? Moses has a whole stack of excuses for why he can’t possibly be God’s spokesman to Pharaoh, and he’s facing a burning bush. Jonah goes to Nineveh after a shipwreck and a whale ride and still has a hard time getting it right. Peter becomes the man who Jesus’ church will be built upon after he denies Jesus three times! 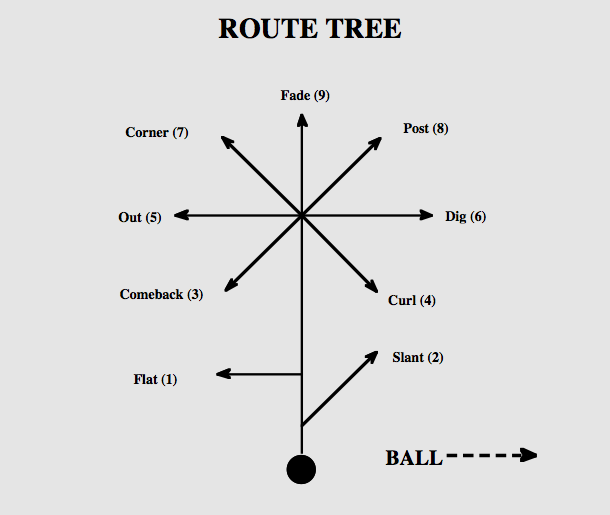 If these people we choose as role models actually had more route trees than an NFL wide receiver, why do we spend so much time waiting to see the correct door open? Why are we so tentative in our decision making? I think it’s easier to believe there’s one way to go than to recognize that God has put us in charge – granted us free will – to make our own decisions. I have interacted with students, and couples, and even longstanding church folk who would rather have me make the decision for them than wrestle with it on their own. They’ll ask me to assign their paper topic rather than choose one, ask me to determine whether they should be married or not, and ask me how they should vote, spend money, or choose right from wrong. It’s easier to have someone else determine that for us than to actually have to get involved. To get dirty. If it has more to do with God’s exact plan and less to do with our free will, then doesn’t it let us off the hook? If we’re going to embrace a God who gives us free will, doesn’t the opposite happen – don’t we have to take more responsibility? If we’re going to find out which way not what way God has laid out for us, if we’re going to find God’s best way for us, then we have some work to do. We need to pray. I believe that God wants to hear from us and talk to us about our families, our money, our careers, our doubts, our fears, and our joy. When we spend time in prayer, it makes us more compassionate to others, and we begin to better understand (note: I didn’t say everything was always crystal clear!) what it is that God sees in us and wants our participation in. I certainly don’t believe that just because you pray that everything will work out the way you want it to, but I know that when I pray, I am more peaceful, more compassionate, more loving. I know that when I pray, it’s easier to remember that God is with me. If I want to know God’s will, I need to be with God! We need to read the Bible. There’s a lot of good advice in there. We need to know what the Bible says about theology, situations, community, and God’s nature. When we are “read up on” those things, we can respond to our own experiences with the background of the Bible. Too often, we read the Bible only when we have to, in Sunday School or when the pastor tags us to read during worship. We don’t know what the Bible has to say, but we’ll let the talking heads on television tell us! We have to read it so we know it for ourselves. We need to listen to those people who are listening to God. I don’t know about all of you, but I’m not ready to give the keys of my car to every one of my friends. But… we all have a tendency to turn the keys of our lives over to other people and let them tell us what we should do. We share stories about our jobs, our spouses, our children, and our beliefs and we don’t necessarily stop to consider whether the people we’re sharing with actually believe in the same things we do. There’s peer pressure that’s good and there’s peer pressure that’s bad. The white fluorescent dance pants I had in the eighth grade that went with my Hawaiian shirt were the results of bad peer pressure. I wasn’t listening to people that loved me and cared about me (and listened to God) and I ended up looking… ridiculous. Too often, when we’re not surrounded by the right people, we look ridiculous. We’ve got to practice the right way. I know that all of us would like to know – or at least say we’d like to know – what God wants from us when it comes to getting married, moving to another state, accepting a new job, etc. All of those are ‘big’ things, right? But do we practice what God wants for our lives in the little stuff? Do we find a way to bite our tongue when we want to snap at someone? Do we stop to do the little things like hold the door or help the proverbial old lady across the street? Are we making time in our day to not be busy and to actually hear the person who is spilling their guts in front of us? Do we make time for God-sized moments to show up in our human lives? Last week’s sermon in our Things Jesus Never Said series, “Everything Happens For A Reason,” works with today’s message because sometimes, we fail to see that our mistakes were God’s moment to shine. When we’re at our lowest, we’re most prepared to set forward and be the kinds of people God wants us to be, knows we can be, hopes we will become. When we hit rock bottom, we are most likely to stop and listen to God. This week, after our Bible study, I’ve been thinking a lot about the Parable of the Prodigal Son. Sometimes you’re the father, or the servant, or the older brother. But today, I want you to think of yourself as the prodigal son. Many of us haven’t reaped our half of the inheritance and headed for the hills. Most of us have never slept outside in the pig sty, eating the pigs’ food. Most of us don’t recognize today how humiliating that would be because to most people of the day, you would now be less valuable than a pig. Thinking about that this week, I thought of some of the jobs I’ve done. I’ve cleaned out ash trays and hand washed strangers dishes; I’ve worked with water and sewer shoveling, raking, and… moving stuff. I’ve worked in retail and fast food, where no one is happy and everyone takes their frustration out on someone else. But I’ve never been as down and out as the prodigal son. I’ve never been so low that the only way up was better. I’ve never been so racked by the frustrations of the world that I was ready to give up. But the beauty of the Prodigal Son is that no matter what decisions you’ve made, the Father is always receptive, always willing to welcome you home. The prodigal has a place, and the Father has a plan. No father wants his kids to go through what the prodigal did, but sometimes, we take our own road home. Whether you came in here today sure of yourself or unsure of everything, know this: God’s love for you will find a way through many routes, past many obstacles, past your own mistakes, to find you. That’s God’s plan, his one and only plan through his one and only Son. No matter what, God’s plan is to bring you home.